Your source for song information. Need any information on a song? Practicing for a big karaoke gig? Music quiz coming up tomorrow? Then you arrived at the right place: SongDNA provides you with the most information about any song! It collects data on any song from more than 7 sources on the internet: the video's, the bio, the highest rank in the charts, tweets, you name it, SongDNA shows it! And you will always have the information at your fingertips, because SongDNA runs on mobile phones. Click on the above tabs to get your version! The iPhone version. The Android version. UPDATE: Sadly my fellow iOS developer and friend Edwin of 8Projects passed away unexpectedly in 2012. Therefor the iOS version of SongDNA has been discontinued. The below page is left in place for remembering him. All you need to do is go to the Apple App Store with your iPhone, search for SongDNA and install it. This is the Full ad-free version of SongDNA, and is available at a minimal charge (definitely minimal if you consider what it offers :). Share artist and track information on Twitter and Facebook in just a few taps. This version is the free, ad-supported version with limited functionality. and many other nifty little details you'll discover by yourself :). Definitely good to get a taste of SongDNA. But if you want it all, and support us developing new functionality, you have to get the above ad-free Full version! The Lite version is temporarily unavailable. Note that the above description is for v2.0 of SongDNA. If you are still using v1.x, please upgrade as soon as possible. v1.x will be phased out in the near future. Below are a few screenshots from the iPhone to give you a feel of what to expect from the application. The start screen. Search results. Details screen. 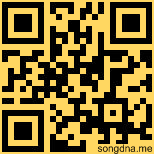 Here you can find all information about the Android version of SongDNA. It should run on any Android 1.5 or higher enabled mobile device. Note on certain details it diverts from the iPhone version. Don't forget to check the FAQ! To install the app, go to the Google Market Store with your phone, search for SongDNA and install it. Or click the Market icon below. Or aim your phone's camera on the QR bar-code below that. Or get it via the Android Market Website. Can't find it in the Market? Download it via GetJar.com by clicking on the icon. Follow the steps provided there. If you don't donate above the threshold, you're done! A browser is started which takes you to the donate page, follow the steps provided there. Below some screenshots to give you a feel for the SongDNA app. Q: Why is the Get now playing button not enabled? A: Get now playing might not work with all devices and music players. To test if it works: press the Home key of your phone. Start the standard music player. Start SongDNA. The Get now playing button should now be enabled. If not, the device/music player is not supported :( Sometimes SongDNA might not detect the player if it's not "reloaded"/restarted. In that case, exit SongDNA via the menu and try the above steps again. Here you can find a list of devices that are known to support the Get now playing functionality. Q: Why are (not all of) the videos playing/sometimes not playing? A: This mostly depends on the (data) network connection your device is using. For example, sometimes it switches between WIFI and your mobile provider network while loading the video. The video player can't handle that too well. Trying it again most of the time should work. Below is a list of known supported devices/Android versions, either tested by us or reported by users. If your phone is not on this list, that doesn't mean it is not supported, we've most likely just not received any report on it. As mentioned above, SongDNA should run fine on any 1.5 or higher enabled device. This is the Widget version that started it all. This widget was entered in the worldwide Vodafone Widget Competition 2009 and won!!! You can download the widget itself here. The widgetmanager is already pre-installed on your phone. Just start it and add SongDNA as an application. Install the Opera Opera Widget Manager. Copy the widget on your phone, browse to the file and open it. This will start it in the OWM. Install the Vodafone Widget Manager. Copy the widget on your phone, browse to the file and open it. This will start it in the VWM. To run it on your computer you need the Opera browser version 9.64 or higher. Dropping the widget onto an empty browser page starts it. The startup page. Search results. One entry opened. Your feedback is very valuable for us to improve SongDNA were needed. Tells on our Facebook page! Got any questions for us? Use the Feedback tab. Don't want to use that? Just contact us in one of the ways described below. 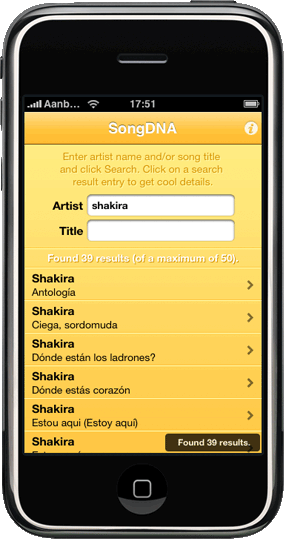 SongDNA is a joint effort between 8Projects and Dedicado B.V. Its goal is to be the source for song information. All information shown is retrieved from 3rd party websites. Below an overview is given. See also the Terms & Conditions at the bottom of the screen.